Mikhail Kogan, MD, ABOIM is a leader in the newly established field of Integrative Geriatrics. He is the editor of “Integrative Geriatric Medicine” Oxford University Press textbook. He is board-certified in Internal Medicine, Geriatrics, Palliative Care, and Integrative Medicine. Dr. Kogan currently serves as medical director of the George Washington (GW) Center for Integrative Medicine, associate director of the Geriatrics and Integrative Medicine Fellowships and director of the Integrative Medicine Track program at the GW University School of Medicine. He is also a part-time faculty at the GW Institute for Spirituality and Health, and GW Center for Aging, Health and Humanities. Dr. Kogan is a frequent speaker at a variety of international conferences and has multiple media appearances related to variety of topics including integrative medicine, geriatrics, Alzheimer’s disease, and medical cannabis. 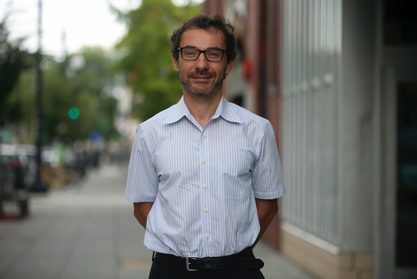 In addition to his academic and clinical roles at GW University, Dr. Kogan serves on national boards and organizations including: the American Board of Integrative Medicine within the American Board of Physician Subspecialists (ABPS), ProCure Art, IM4US - Integrative Medicine for Underserved, and others. Dr. Kogan is the founder and chair of the board of AIM Health Institute a non-profit organization in the Washington, D.C. metropolitan area that provides integrative medicine services to low-income and terminally ill patients regardless of their ability to pay. Nina earned a Masters of Science degree in Biology/Microbiology from Missouri State University and currently works for the United States Department of Health and Human Services, in Washington, D.C. Originally from Moscow, Russia, Nina has background in gymnastics, Latin and swing dancing. Nina has been a part-time fitness instructor for over 12 years teaching group exercise classes such as yoga, pilates, Zumba, Zumba for seniors, Aqua Zumba and swing and Latin dances in the seacoast area. Students in her classes range from teenagers to 90+ year olds. Nina has been performing with various local dance companies and recently started her own Ladies Salsa Styling team in Portsmouth, NH. She was featured as a principle dancer in 2016 Disney's feature movie "The Finest Hours". Nina loves sharing her passion for dance, fitness and health with people around her. She lives in Kittery, ME with her family, husband and their four children. 5:30-6:00 pm Welcome and Introductions. 7:00-8:00 pm Core Principles of AgeWise Health and Blue Zones: didactic. Learn about areas in the world where people routinely live to 100 years old while staying healthy and active. Dr. Kogan created AgeWise Health Paradigm which incorporate the wisdom of Blue Zones with modern scienfitic understanding of aging and longevity. 9:00-10:00 pm Optional Movie "The Science of fasting"
Yoga is one of the oldest and most effective movement and mind-body practices and has become widely accepted with the general public and the healthcare system. Yoga slows down the aging by improving balance, flexibility, strength, breathing and body-mind awareness. In the last decade the theories of fasting and FMD being critical for longevity and optimal health have taken a central place in many conversations within ingratiate and allopathic medical worlds. In this lecture we will learn both the science and practice of adding intermittent fasting or FMD into one's life styles. Pilates, an exercise system developed by J. Pilates, uses principles of centering, concentration, control, precision, breath and flow, and enhances yoga practice to build strong core. 12:00 - 1:00 pm Lunch. Mindful Eating. Participants will learn about key nutritional aspects that help us to keep vibrant energy and avoid diseases. Rather than discuss "diets", we will concentrate on nutritional life style based on an anti-inflammatory approach largely centered around a modified Mediterranean diet practiced in two of the most famous Blue Zones: Sardinia and Ikaria. We will also discuss many controversies such as what fats are good, is alcohol and or good, as well as discuss in detail sources of food and why they are critically important. Qi Gong is one of the oldest part of the traditional Martial Arts practices aimed at building internal energy and centering awareness on the body's energy flow. In this introductory module, participants will learn 8 Brocades Qi Gong and several key parts of Wudang Qi Gong. Qi Gong is used as one of the key longevity approaches in Chinese medicine. 3:30-4:45 pm Cold Exposure - On Becoming the Iceman: didactic and practical. Cold exposure is well known to have a myriad of positive health benefits. Presenters also believe that is it one of the key longevity practices based on optimizing metabolism by increasing metabolically active brown fat content while decreasing non-active visceral fat. Recent research showed that dance, among many physical benefits, can provide significant improvements in several aspects of brain function involving cognition and sensorimotor performance, In this easy to follow session, that feels more like a party, participants will experience Zumba, a Latin based dance exercise system. Last year, it was ranked the number 1 workout for combating anxiety and stress due to its combination of energetic atmosphere, upbeat music and strong community feeling. 6:00 - 7:00 pm Dinner. Mindful Eating. 7:00-8:00 pm Introduction to Sufi Healing Practices: didactic and practical. Sufism is largely misunderstood mystical tradition with complex healing system based on learning ones own inner rhythms of metabolism, breathing, mind processes, and core body needs. In this workshop, participants will learn some core principles of Sufi healing practices, such as working with breath and Shagal, and how to integrate them into modern living. 9:45-10:45 am Review of the Remaining AgeWise principles. Q&A with Dr. Kogan and book signing. In this lecture, Dr. Kogan will address in detail the remaining core principles of AgeWise health, such as sleep and rest, family and community, intimacy and fun, spirituality and life's purpose, and how to begin incorporating them into one's life. There will also be a short book signing, if you like to purchase Dr. Kogan “Integrative Geriatric Medicine” Oxford University Press textbook. Books will be available at the retreat at the discounted price. By this time, participants will have generated lots of thoughts and ideas and also will come to realize where their largest challenges are to optimizing ones health. In this practical workshop, using the guided meditation process, participants will try to find inner solutions to removing blocks in their health optimization and create personal AgeWise Health Plan and Pledge. 11:45 - 12:00 pm Meditation and Closure.